There are options people, and there are process people. When the options become overwhelming, it can stop you dead in your tracks. Here’s how to keep yourself from becoming frozen when making choices about your VO auditions and performances. It can really be a struggle as a VO artist to lay down take after take, pick the best one, and submit your audition…then not to have self doubt about your choice. If that’s you, if you’re doing 5, 10, 15 takes or more, I invite you to move away from that overwhelming, slow, options-oriented approach. I invite you to try a process-oriented approach. 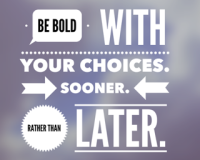 Make bold choices. Make them sooner rather than later. The truth is, you’re going to get wherever you’re going with your adjustments on your performance sooner or later. You’re going to change any number of vocal values on the path to getting to the “good” take. So do that. But don’t be timid. Don’t make minor adjustments. Instead, have the faith in your own abilities to make bold ones. If you do that, you’ll start moving through your auditions with speed and power. You’ll get to the same place, but you’ll get there faster. And your confidence will mushroom. You’ll start doing auditions in 1 or 2 takes. Imagine the time you’ll have to do more auditions and work. Do the same thing when you get booked in the studio, and you’ll be regarded as someone who is great, and fast and worth booking again and again. Be bold. Don’t think you have to move slightly along the path to successful performances. Move boldly along that path, and get to your target performance quicker. Flub a word? Pick it up. And then get it done. No more sentence-one-from-take-four-and-sentence-two-from-take-seven-and-so-on overwhelm. That’s going to leave you more time to do more auditions. And to do them well. I have faith in you. Have faith in yourself. Put to use all this stuff you’ve been learning here. 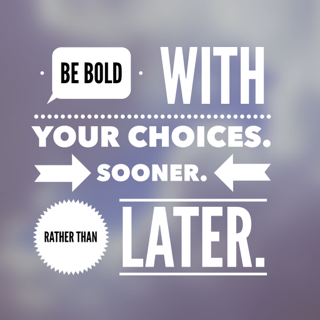 Be bold with your choices. Sooner rather than later. Hi David – well, you’re bang-on once again. You’ve described my auditioning process mostly to a ‘T’. No wonder I am starting to become audition-adverse! Thanks for another practical tip! Wonderful advice! I have heard similar advice in acting class as well. I’m just starting my VO class and am soooo excited. Such a good reminder! Thank you for this! I recorded my clip for this month and felt like I went into it with more gusto and less judgement. I am still coming to terms with “going for it” vs. “pushing it”. I know the goal is to be coming from a place of truth, but that can be a gray area for me when it comes to commercial copy for some reason. And I’m pretty sure, my going bold is not as overly bold as I think it is. I just love this advice. I’m putting this up on my wall as a reminder. Thank you for this advice. Sometimes it takes 101…to sink in.